Oh man, this Loaded Cauliflower Bake is good. Decadent, creamy, cheesy…all my favorite buzzwords. I don’t even usually love cauliflower, but I sure do love it here. This tasty side dish takes all the things you love about loaded mashed potatoes (the gooey cheese, the smoky bacon, the fresh scallions and the creamy sour cream) and gives them a healthier, low carb base. I actually really enjoyed the texture of using cauliflower, and the result tasted sinful but for only 9 carbs per serving! This bake would be a great way to get picky eaters to get their veggies in and it’d be equally at home on your holiday dinner table to impress company or on a picnic table for a backyard barbecue. How versatile is that? No one would ever guess it’s a lightened dish and I can almost guarantee you’ll be asked for the recipe. I want to give a shout out to De’Anna Groves who contacted me via my Facebook page to request I find a way to lighten up this recipe – love it! Pre-heat the oven to 350. Lightly mist a 2 QT baking dish (I used a 7×11) with cooking spray and set aside. Cook the bacon slices until crisp according to package directions and allow them to cool/dry on paper towels. Crumble them into bite sized pieces and set aside. Steam cauliflower florets until tender. If you’ve never steamed cauliflower before, this link has three different steaming methods based on what equipment you have available/your preference. I used the first method, but choose your own adventure! While the cauliflower steams, combine the softened cream cheese and sour cream with a hand mixer. Add 3 oz of the shredded cheddar and 3 oz of the shredded pepper jack, the bacon pieces from step 2, the chopped scallions, garlic, salt, pepper and red pepper flakes. Stir until well combined. When the cauliflower is finished steaming, drain if necessary and add the hot cauliflower to the cream cheese mixture. Stir until well coated. If you’d like at this step you can partially mash some of the cauliflower (I did a little bit, but kept many florets whole for texture). Transfer the cauliflower mixture to your reserved baking dish and top with the remaining 1 oz each of shredded cheddar and pepper jack cheeses. Bake for 30 minutes. If your cheese on top isn’t golden, turn on your broiler for 1-2 minutes until golden and bubbly. This sounds amazing…what is the serving size? This looks SO good…cannot wait to make it! This looks amazing! I just made a cauliflower gratin likes this with goat cheese. So yummy! I think Anna meant, what is the actual size of the serving? I’m guesstimating in between a 1/2 cup to a 2/3 cup. Am I right? P.S. This dish looks incredible, gotta try it! Oh, I understood what she meant, I was just explaining that I didn’t measure it that way, I cut it into pieces. I just measured a serving of the leftovers and it was about 3/4 cup. Oh, this looks so good! I could see having it with a couple of eggs for a brinner type of meal. How does it freeze/reheat? As soon as I saw this last night, I changed my plans for what we were having for dinner tonight. It was excellent! I did mash up the cauliflower pretty well so it seemed more like a potato consistency. The family loved it and had no idea it was cauliflower. I told my husband after dinner and he begged me to make it again soon. Thanks, Emily! Haha, I hope he eats it and loves it! My cauliflower was tender…not like mushy soft, but no longer crisp either, if that makes sense. Hi Lisa! I served it as a side dish for BBQ chicken, and I think it makes a great side dish for any meat (chicken, steak, pork, etc). If you want to eat it as a main dish, it’d be great with a side salad. Made this as a side dish tonight and the kids and I LOVED it!!!! Great recipe, thanks a billion!! Whoa, Emily- you did it again!! I just made this to serve for dinner tonight and I seriously struggled not to eat the whole thing at 8:30am!! You are simply brilliant, this might be my new Favorite “Emily”!! I didn’t have any sour cream so I used plain Greek yogurt instead and it came out wonderful 🙂 it will be a weekly repeat for sure! This dish was amazing! I couldnt find the lowfat pepperjack so i used some mozzerella that i had. Excellent! I made this last night and even my husband asked for more. 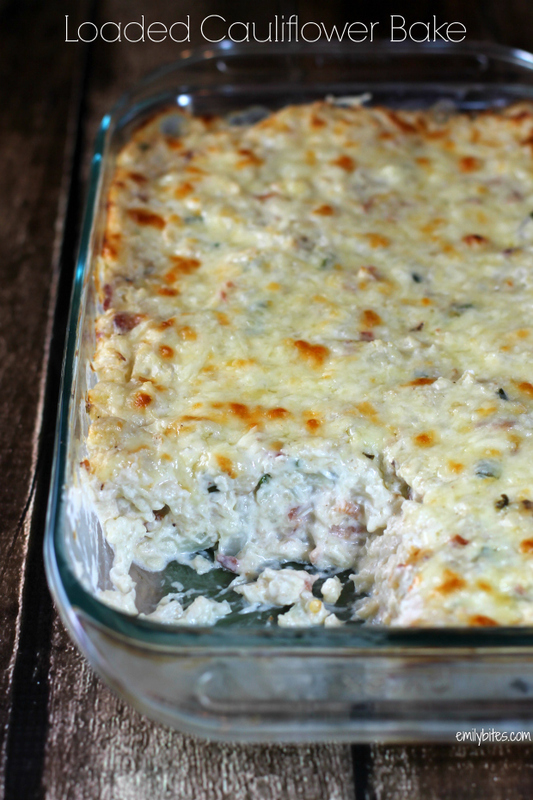 I used greek yogurt and bacon bits to speed it up…. sooo good! Emily, this is my FAVORITE so far! Only problem liked it SO much, tonight we will have had it 3 nights in a row and that means I got 6 servings out of it, but that’s still a bargain for the calories. Used 2% plain greek yogurt for the sour cream and full fat pepper jack cuz I couldn’t find the other. OMG! Absolutely delicious!! The whole family loved it. I really like a lot of your recipes!! Thanks! AMAZING!!!!! My boyfriend doesn’t like caluiflower and he took a bite and went back for another bite! I gave some out to my mom and dad and friend at work and they all loved it and asked for the recipe. I am bumme that I only have one serving left at home. Great job! I am excited to try this, but do you have any suggestions on where to find low-fat pepper jack cheese? I can’t think of anywhere I’ve ever seen it (Kroger, Target, Wal-Mart, etc.). Thanks! Oh wow!! Made this last night with dinner and it was a big crowd pleaser! I had no left overs and have been ordered to make it again soon, lol. Thanks so much for another great recipe! HOLY MOLY, I made this last night and it was INCREDIBLE. My fiance is allergic to dairy so this one is definitely off-limits for him…which is fantastic, because HAHA, MORE FOR ME. I ate three servings last night and look forward to leftovers today. Like a previous commenter, I subbed in greek yogurt for sour cream. Also, your bacon cheeseburger wraps? Ever since I made those (a regular on our weekly menu now) I have been keeping the bacon bits on-hand, and I used those instead of cooking up actual bacon! And I also top everything with Sriracha, and this was no different. AMAZE-BALLS. I can’t stop putting things in caps. Thank you so much for this recipe! Just made this today and it was awesome! Have you ever tried this recipe with broccoli instead? My dad isn’t a huge fan of cauliflower. I’ve just switched to Simply Filling and I’m having a hard time figuring out how to count this. So, I know the cauliflower and the fat-free sour cream are power foods but how in the world would I count points for a “serving” of the cream cheese, shredded cheese, and bacon? Would I just count it as 4 points? Sorry if that’s a dumb question…I’m still learning about the Simply Filling technique. 🙂 This looks yummy! Hi Amanda, I’ve actually never done Simply Filling (I’ve always been a points girl), so I’m not 100% sure and don’t want to steer you in the wrong direction. Maybe try asking on the WW Simply Filling message boards? I made this last night and it was SO YUMMY! I had a hard time controlling myself – wanted to eat the whole thing. Thanks for the great recipes Emily! Can this be frozen and baked later? I’ve never tried doing that but I expect it’d work out alright! I made this for dinner today and it was a HIT!!!!!!! I didn’t get a chance to buy the bacon & scallions and it tasted awesome. I’m sure the bacon would put it over the top since my family loves bacon. Thank you very much for the recipe. I served it with baked pork chops. Can this be made the night before. Should I bake it first? can you make this ahead, then bake later???? Or will it ruin the texture??? Wow! This was sooooo good! I made a half batch with 16 ounces of frozen cauliflower that I cooked in the microwave. My husband and son loved it, and I didn’t even miss the potatoes. Can’t wait to have leftovers with lunch tomorrow. Regardless of your feelings on cauliflower, you must try this recipe. It’s flipping amazing. I don’t like cauliflower but could eat the whole pan in one sitting. I’m so glad you loved it Jennifer! I actually feel the same way. My husband loves cauliflower and I usually pick around it when serving myself vegetables, haha. Made this for the boyfriend who doesn’t like cauli – he loved it. I used half fat creme fraiche instead of sour cream and we can’t get pepper jack cheese, so I used cheddar with chili. Will certainly be making this again! Planning on having this for dinner tonight so I worked out the SmartPoints based on the nutritional info on your site. Turns out to be 6 Smart Points according to the WW calculator on my app. Once again a big hit at our house. I even added extra cauliflower with the same amounts of cheese, etc, and it was still great. What a nice substitute for potatoes. This is amazing I have made it three times since I found the recipe last week!! All your recipes are absolutely amazing. Thank you!!! Whoa Emily. You outdid yourself with this one I think. I finally made this to go along side some ribs when we had a guest coming for dinner this past weekend. My man and I both loved it but I was even more thrilled to see our guest (who is an old bachelor, getting most of his meals from the nearest truckstop) go back for 3rds. He could not stop eating it and raving about it. So much so, that I sent him home with all the leftovers 🙁 I guess I’ll have to make this again this week so my house can enjoy it again too! Wow! I don’t usually write a lot of reviews but I just had to say how much this recipe exceeded my expectations even after reading all the good reviews. This is going in my files as one of my go to side dishes. It tasted just like loaded potatoes. I left out the scallions because I just don’t like them and I mashed the cauliflower up some but left the smaller pieces like you recommended. I loved the texture and the flavor was out of this world. Thanks Emily! Can I just say YUMMY! This was fantastic! Taste better tha a baked potato. I made this and it is so amazing. So much flavor and you don’t miss the potatoes at all. Thanks for all your recipes. I bought a bag of cauliflower rice to use and this recipe was absolutely off the charts good. It was even better as leftovers! It tastes so much like cheesy potatoes. 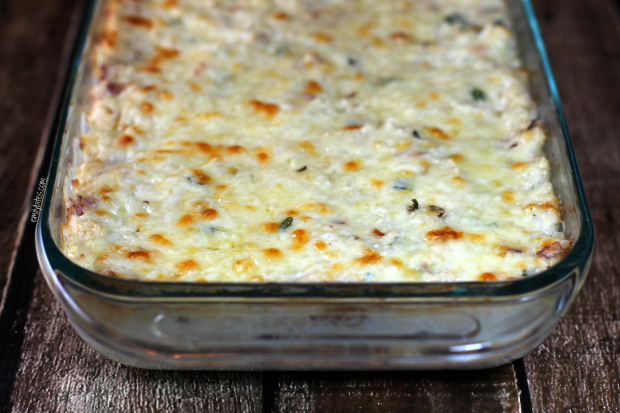 I made this for dinner tonight with your crockpot meatloaf and they were both AMAZING. 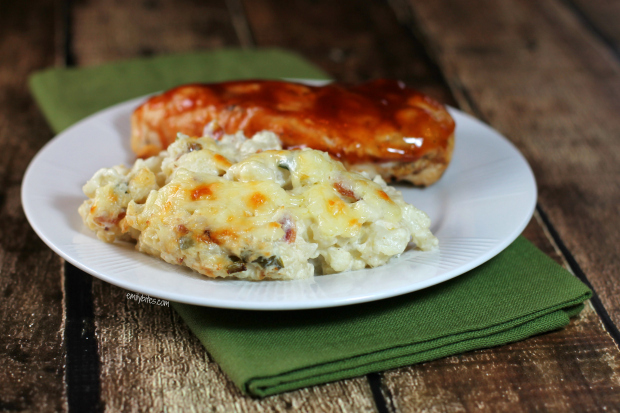 The cauliflower resembled potato casserole so much and I love potatoes with my meatloaf! My husband even asked me to make this a regular dish we make. Thanks for such a great recipe, haven’t had a recipe of yours yet that I don’t absolutely love.